I have taken a quick look at the precipitation event that is well underway over the Northwest. Above is blended PW analysis for 3 am MST this morning over the eastern Pacific. A distinct plume of high PW [currently referred to as an atmospheric river (AR) by the community] extends from north and west of Hawaii into northern California, where heavy rains have been occurring at the reporting stations. Heaviest precipitation amounts will occur where the moisture plume intersects higher terrain of the Sierras. 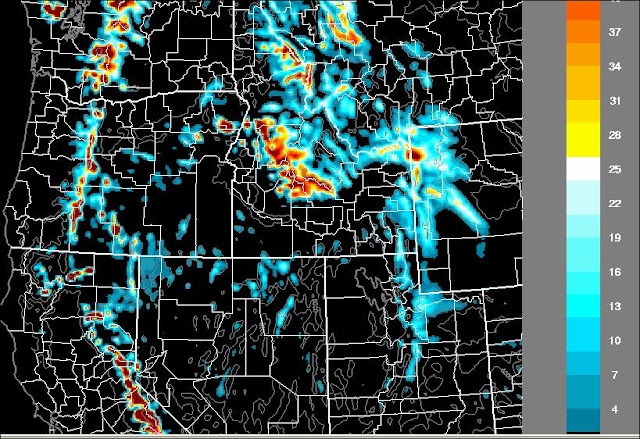 The U of A Atmo WRF-GFS model includes a northwestern US domain and the two products here are from the forecast run (on the 5.4 km grid) initialized at 5 pm MST last evening (Thursday, November 29th). Above is forecast of total precipitation, rain and SWE, for the period ending 5 am MST next Monday morning (December 3rd). Purple shadings indicate amounts of 10 to 20 inches! Image below shows total accumulated snowfall forecast by the model for the same period. In this forecast the darker red shades indicate snow amounts of more than 40 inches. 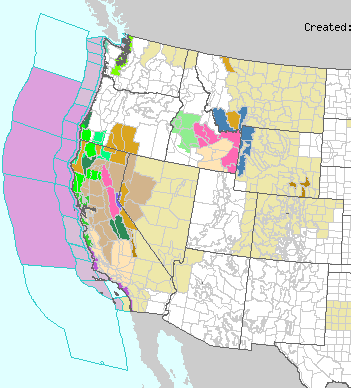 This is quite some event and it is generating weather chatter across the whole country. Meanwhile, down here in the Southwest, November ends having produced only 0.16" of rain here at the house - a tad better than than the 0.02" of October. 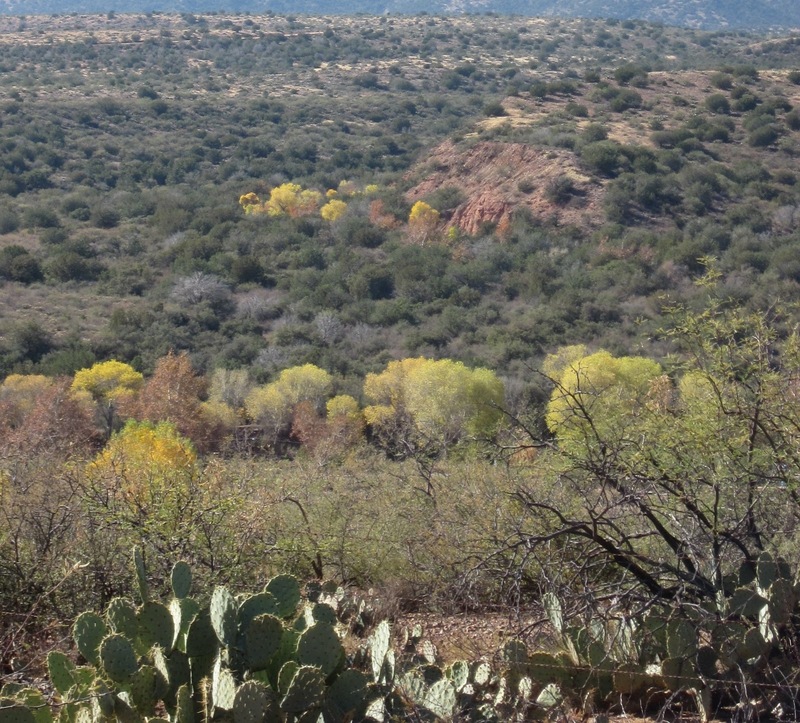 November is closing out here in southeast Arizona much as did October - a single, light precipitation event each month. However, very significant precipitation is expected over much of the Northwest as several impulses associated with the large, complex cyclone over the northeast Pacific (above is water vapor image this afternoon - 29 November 2012) come ashore and interact with the mountains. Rain amounts forecast by the models are prodigious, with some areas forecast to receive 5 to over 10 inches of water equivalent precipitation through the weekend. Current weather watches issued by the NWS offices in the West are indicated below. 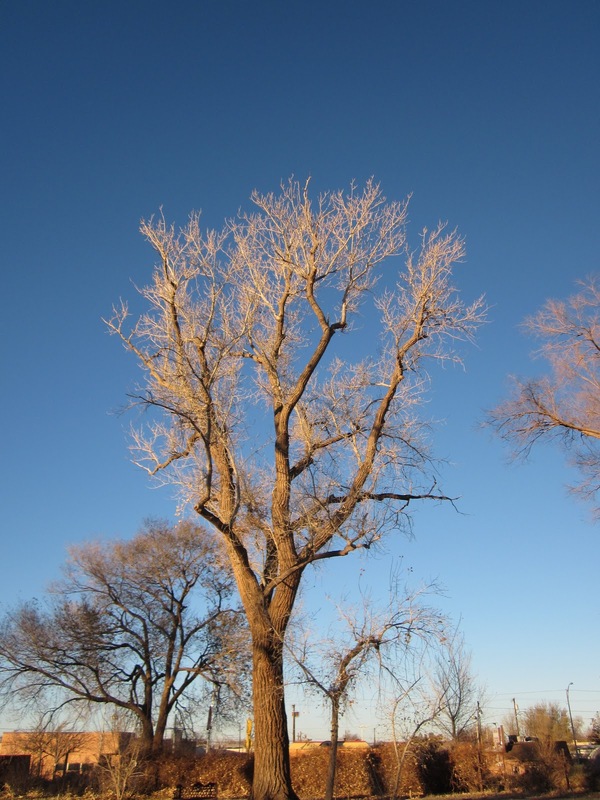 Winter Cottonwoods on the grounds at La Posada Hotel in Winslow. View of San Francisco Peaks looking west from Highway 87 about 20 miles south of Winslow (Saturday November 24th). Snow visible on highest elevations. There was a bit of snow on shadowed curves at highest elevations across the Rim also - apparently from the storm of November 9 and 10. Some Fall color in wash near Rye, Arizona. We have been away on a quick 2-day and one night trip and have just returned. Quick check of the observations shows that TUS low this morning was 62F with east winds up to 30 mph or so during the night.. So, yesterday morning's (Friday the 23rd) forecast for east winds and much warmer low temperatures was right on - yet again. See yesterday's post below.It appears the low here at house was around 50F but I am still having problems with my thermometers. Very strong 24-hour pressure rises are pushing the Front Range, and a backdoor front will push across southern New Mexico into southeastern Arizona today and tonight. 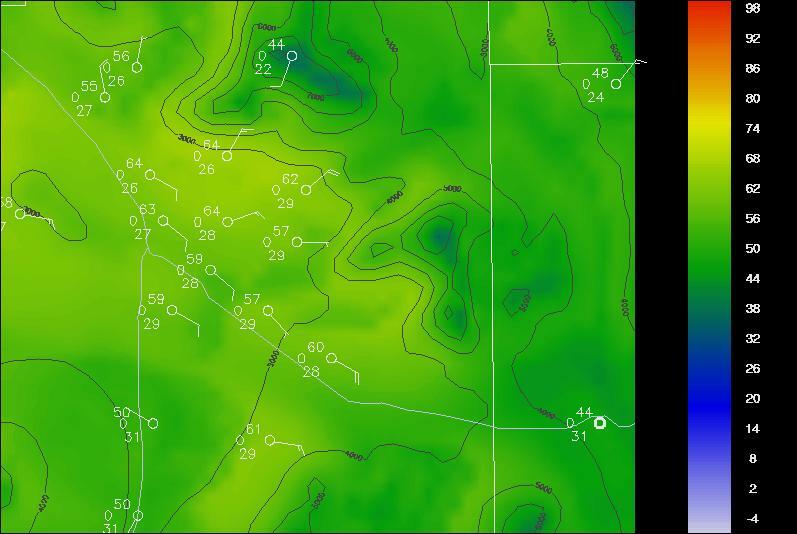 Pressures have risen 20 to 25 mb behind this front as it pushed south across Colorado and into eastern New Mexico - surface plot above from NCAR RAL at 7:30 am MST. These kind of events make temperature forecasting very difficult for the nighttime hours here in Tucson. Plot below shows this morning's early WRF-GFS forecast of metro surface conditions at 4 am tomorrow morning. Temperatures are forecast to be in the upper-50s and low 60s. The east winds are not extremely strong, so it may be another morning with temperatures all over the place across Tucson area. Thanksgiving Day has dawned and it looks to be a very quite weather day for the continental U.S. 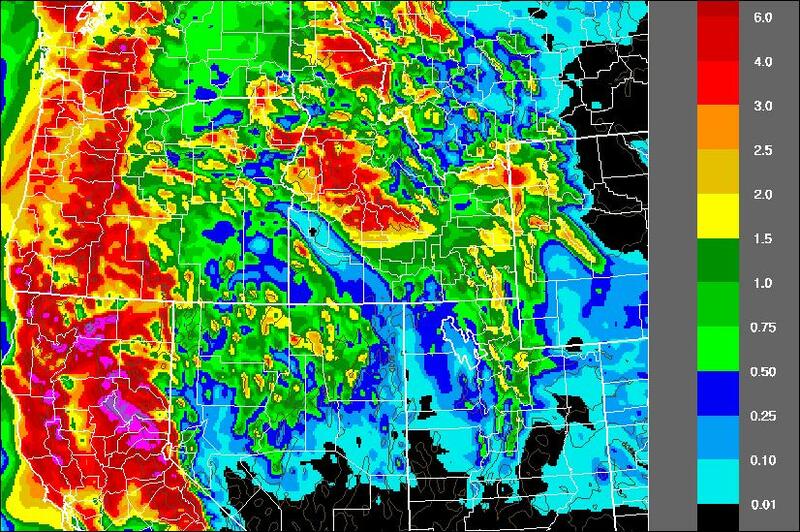 Above is the national radar composite chart for a bit before 8 am MST and below is the thunderstorm outlook from SPC for today. I hope that everyone who visits here has a great Thanksgiving Holiday. 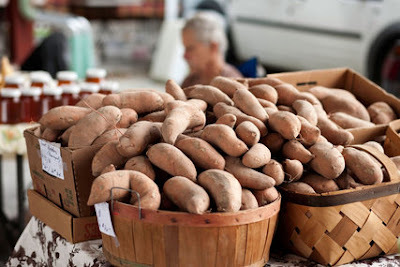 Since this is a Holiday with a serious emphasis on food, I'll avoid Turkey cliches and instead recommend Mark Bittman's essay on sweet potatoes. A weak short wave is moving across the Southwest and northern Mexico this morning (21 November 2012) as per the 14 UTC water vapor image shown above). 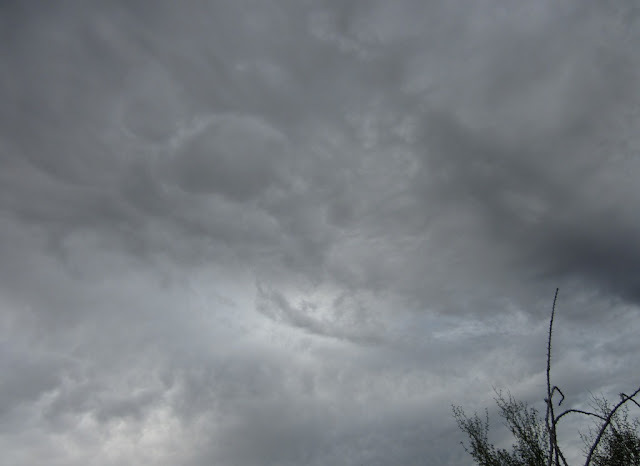 Its impact here in Tucson area has been mostly middle and upper-level cloudiness. 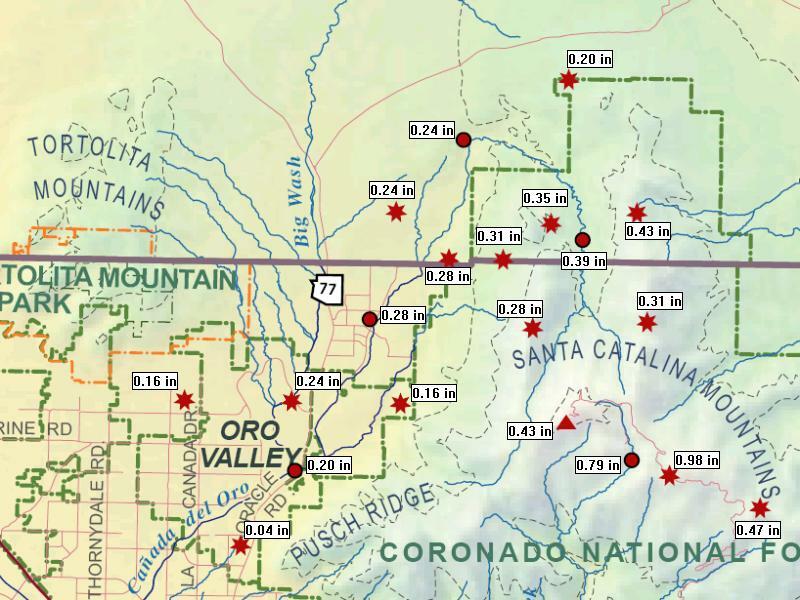 I did find one report of rain during past 24-hours, 0.01" at the Rucker RAWS site in the Chiricahuas. Low temperatures were on the mild side because of the cloudiness - lower 50s at airport and 46-48F here at house (I'm having problems with my max/min thermometers that I need to resolve). 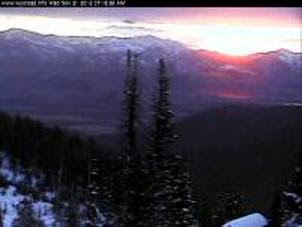 Above is web cam view of the Catalinas a bit after 7 am MST and below is of the sunrise at Teton Pass, Wyoming (from Jack Hales web cam cluster available at his web site - link to the right). There is not much in the way of weather this morning across much of the United States. However, I was checking the national radar composite at the CoD web page and noticed some echoes that seemed suspect. The image above is base reflectivity for Flagstaff, Arizona, at about 7 am MST this morning. The White Mountains are painting a strong echo area. The two highways heading north and northwest out of Flagstaff are also showing lines of strong reflectivity. So, the radial velocities are playing a role in the clutter suppression procedure failing. 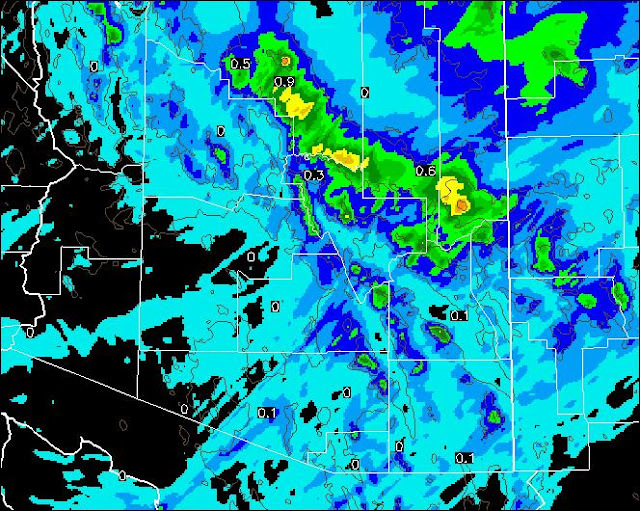 Graphic below is Storm Total precipitation for Flagstaff at the same time. This image indicates that precipitation is accumulating, and probably going into the NWS radar archives to lie in wait for some future researcher to puzzle over. Image below is base reflectivity from Sacramento, California (a site notorious for its ground clutter problems). Sacramento is also showing echoes over or along major highways. Even more interesting is the circular blob of stronger echo that appears to be near the Sacramento River Delta. I thought that this might be due to birds or bugs, but a look at the radar loop indicates it is stationary and thus clutter from something. I had put a clutter post up several months ago and David Blanchard (NWS Flagstaff) alerted me as per below. But, there seem to still be some problems at some of the radars. RDA/RPG Build 11 included the CMD (Clutter Mitigation Decision) algorithm. This was an enhanced, automated feature to remove clutter. Build 12 was the first build to support Dual-Pol. Unfortunately, it was based on the older Build 10 which did NOT have the CMD. 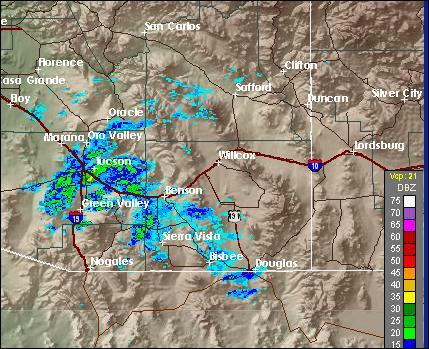 Light showers occurred over southeastern portions of the Pima County ALERT network during the night. About 20% of the stations measured light amounts of rainfall, generally less than 2/10 of an inch. There's some humidty this morning and a nice smell of rain. 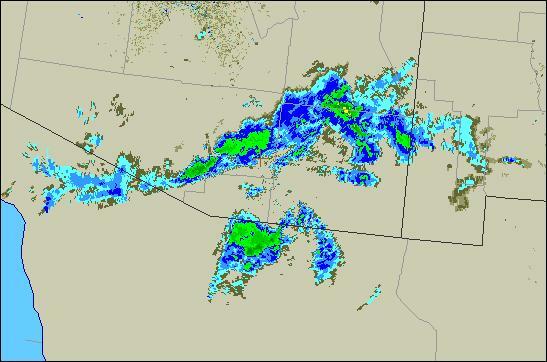 The regional radar image above is from around 10 pm MST. 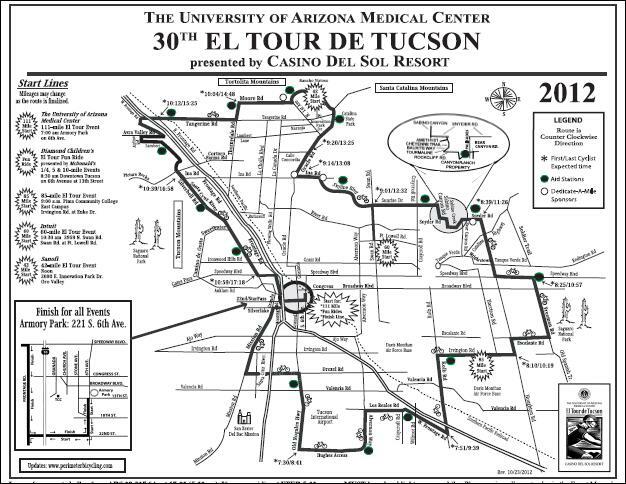 Today's other big event - el Tour de Tucson - is the annual, long distance bicycle race around the outer perimeter of Tucson. 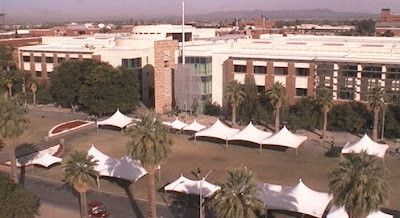 This is an annual event held on the Saturday before Thanksgiving. 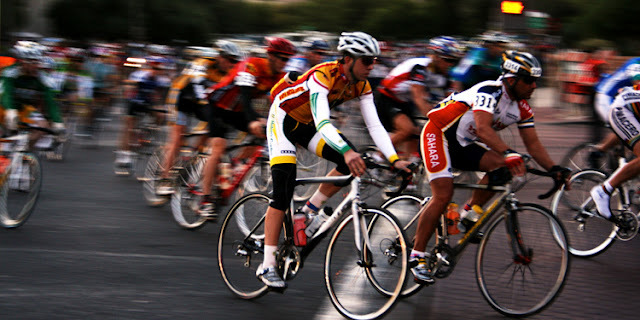 It now attracts around 10,000 out-of-town cycling enthusiasts. Sunscreen not needed this morning. Doing other things this weekend? - remember some traffic will be messed up at certain times. 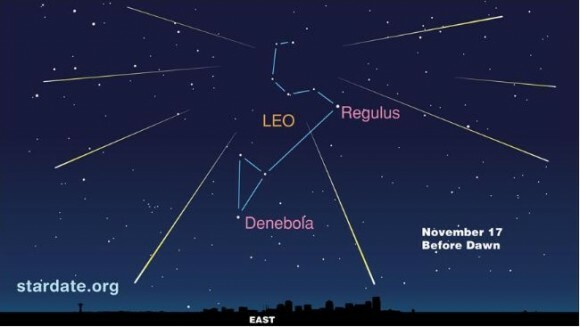 The Leonids meteor shower (above) is peaking this weekend. 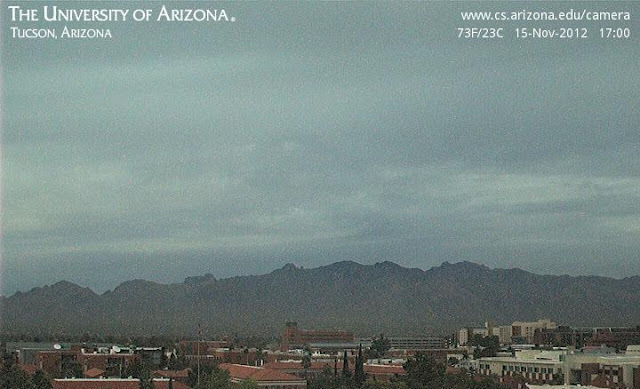 However, a long plume of middle and upper-level cloudiness from low-latitudes is making viewing difficult to impossible across southern Arizona. Image below is 13 UTC water vapor image for the eastern Pacific. So it goes. 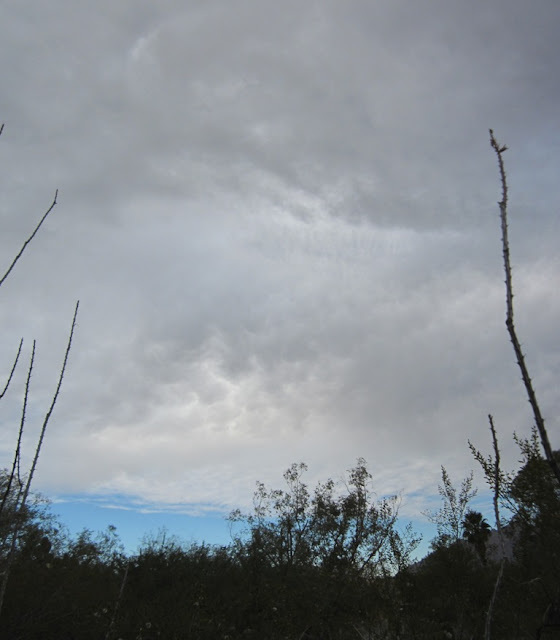 This afternoon there are some middle-level buildups, with mammatus, over the Tucson area. Images are for 3:30 pm MST and above is visible satellite image, while below is the NWS radar composite reflectivity. Radar indicates that there is perhaps a small shower just east of the airport. Two photos taken looking to the northwest to north from the back yard. Time is also about 3:30 pm. It was a mostly cloudy and dreary day today (Thursday November 15th) with temperatures not as warm as yesterday. The images shown are for 5 pm MST of the Catalinas above and water vapor image over east Pacific and the West below. The view of the Catalinas shows that the air was somewhat dirty today. Yesterday there was probably a 50F diurnal swing in temperature - am low here was 32F and high at airport was 83F, similar values today were 34F and 77F. 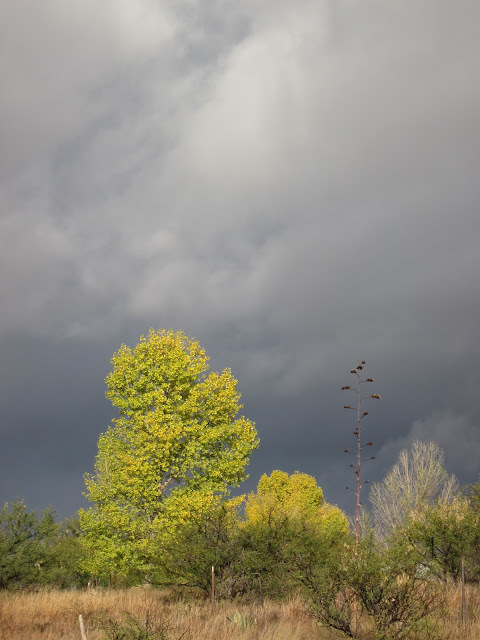 The clouds from the Pacific moved quickly across the Southwest after sunrise and gave us a markedly different day. Still considerable high and middle cloud likely to pass by tomorrow, with perhaps some virga or light sprinkles in spots. First, a bit about the low temperatures this morning. Yesterday's WRF-GFS forecast for TUS was too warm. Winds became light and temperatures dropped lower than the model forecast of 56F. The airport and Atmo reported morning lows of 45F (here at house the low was 32F). However, DM AFB appears to have had a morning low of 56F, with stronger winds persisting there - only about 4-5 km separate DM and TUS. 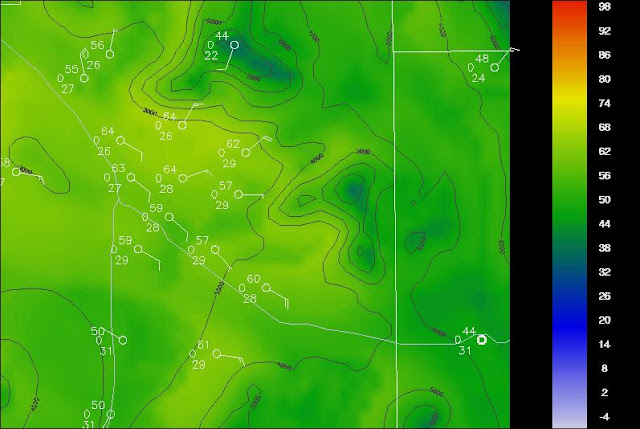 Another example of just how difficult forecasting the low temperatures can be here inside the Tucson city limits. There is a fairly distinct upper-level cyclone spinning in the Eastern Pacific this morning. The 6 am MST water vapor image (above) indicates this feature is at about 30N and 140W. There is a considerable amount of PW with this system, as the 3 am blended analysis (below) shows - light blue indicates about 40 mm of PW. This morning's NAM analysis of RH at 700 mb for 12 UTC (above) shows that the model has high RH in about the right place. But it is not obvious that the model has this system initialized well. The 48-hour forecast (below for 12 UTC Friday morning) indicates a fairly substantial area of high RH air at 700 mb coming ashore into the Southwest. After 48-hours the NAM lowers the RH and minors the system out. However, something to keep an eye on the next couple of days. 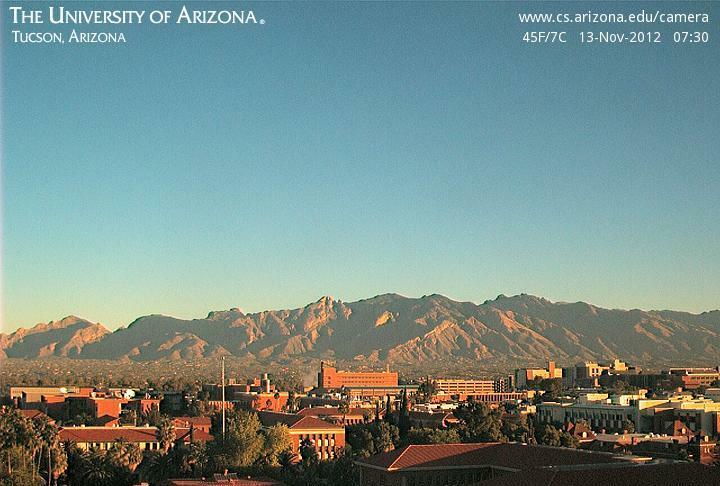 Cloudless skies at sunrise today - view above is of the Catalinas at 7:30 am MST. Three cold mornings here at house with lows of 28F Sunday, 25F Monday, and 28F again this morning. 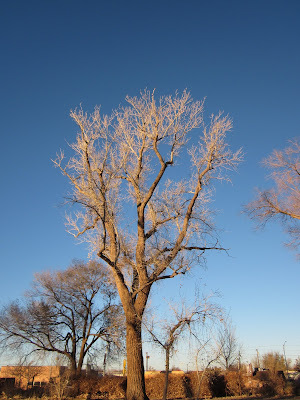 Yesterday morning, when I walked along the Rillito at about 10:30 am, I was quite surprised by the winds. They were light, but were also from the west. At the same time winds at the airport were from the east-southeast with gusts of 30 to 35 mph. 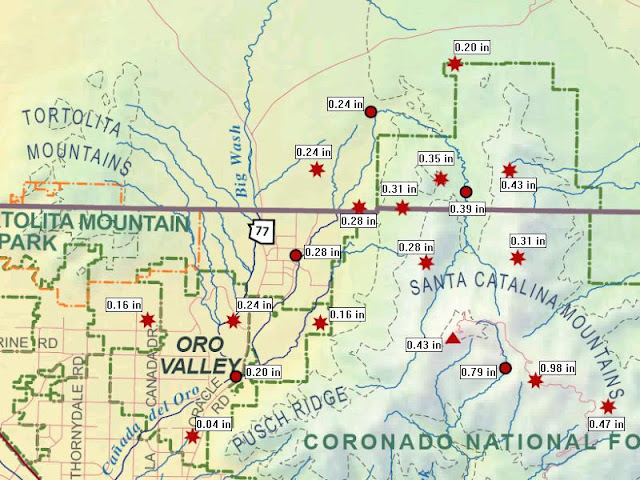 There was obviously some smaller scale circulation present here on the north side of Tucson. The winds never did blow very hard here yesterday. The early WRF-GFS forecast for temperatures is quite interesting this morning - see table above. The forecast low temperature for TUS on Wednesday morning (tomorrow) is a relatively balmy 56F. The surface forecast for 6 am tomorrow (below) shows that the model forecasts east winds along the I-10 corridor. The forecast has east winds blowing through the night, and thus the mild nighttime temperatures. Will it be windy here at the house? At 6 am MST this morning the temperatures are all over the place. Here at the house it is 26F, but at the airport it is 47F (note TUS had a low of 35F during the night). 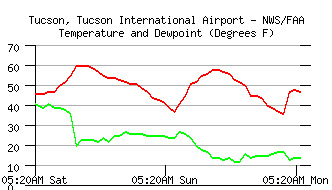 The TUS time series of T and Td (above0 shows a nice jump in temperature around 4 am, when east winds set in. Other 6 am temperatures from low elevation to high: DM AFB 45F, Atmo 39F, Saguaro (Sabino Canyon) 33F, Mt. Hopkins 50F, Rincon 42F, and Mt. Lemmon (Sollers) 41F. So it's warmer at higher elevations and also down in the metro where the east winds are occurring. We have been away since Friday afternoon. When we left town there had been no further rain during the day on Friday. We drove south down Highway 83 after dark Friday night and winds were quite variable. Near the USGS Barrel Canyon stream gauge winds were nearly calm around 7:30 pm. 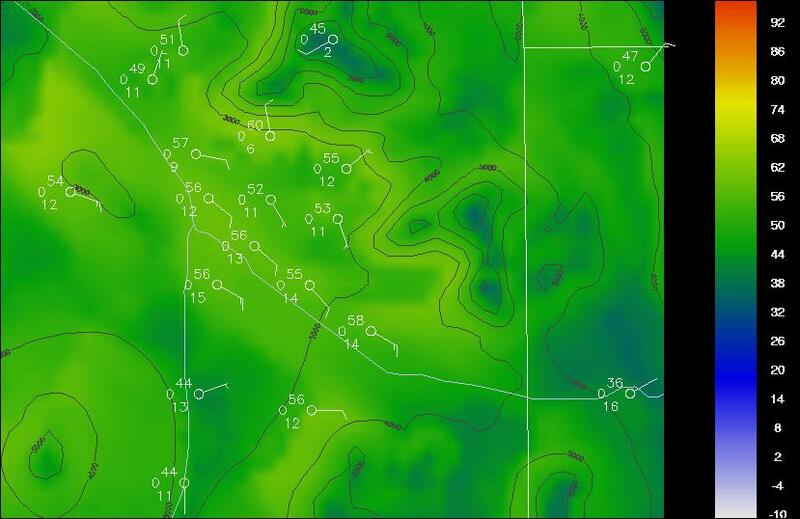 However, at the high spot a bit farther south (i.e., just east of the proposed Rosemont Cooper mine) winds were very strong from the west, blowing at an estimated 30 to 40 mph. When we returned home late yesterday (Saturday November 10th) there was an additional 0.05" in the rain gauge - making the storm total only 0.16". The low on Saturday morning here at house was 38F, but this morning it has dropped to 28F - making this the first below freezing morning here this Fall. Above and below are two shots taken from Santa Rita Abbey at about 8 am MST Saturday morning. Heavy storm clouds were hanging on the Santa Rita mountains (view is to the west where clouds obscure the mountains). Still some Fall colors out there. 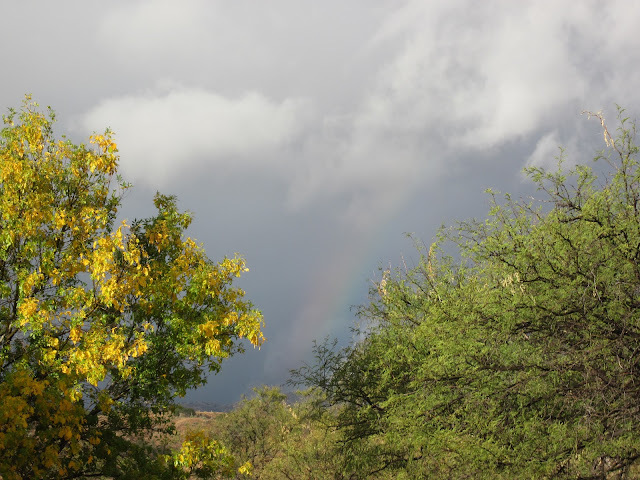 There was also a bit of a morning rainbow present in the top photo. Looks like tonight will be a bit of a challenge for forecasting low temperatures. Above is Atmo's early WRF-GFS forecast of surface conditions across the metro area at 6 am MST Monday morning. 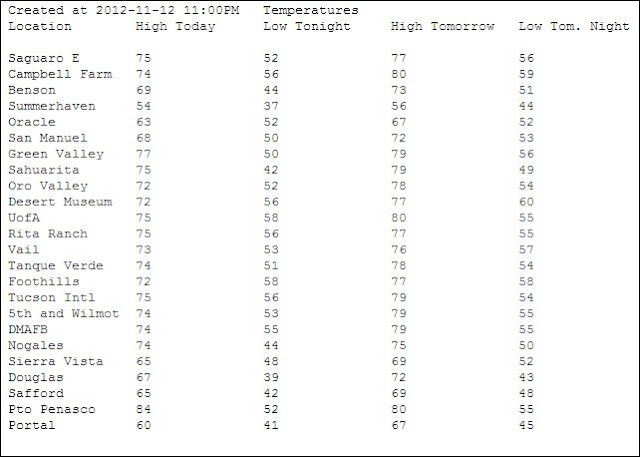 Dewpoint temperatures are very low and rapid cooling should occur after sunset. But the model forecasts some east winds after midnight. The temperature ranges from 52F in the northeast part of town, to 47F at the airport, to 35F at Green Valley. Here at the house I expect that conditions will remain calm during the early morning hours and that our low will be in the middle 20s, but other locations will be more difficult to call. Today we remember all who have served their country in the military - Veterans Day - celebrated as a Holiday tomorrow. The 500 mb short wave continues to dig south-southeastward down the California coast - above is 8 am MST water vapor image. 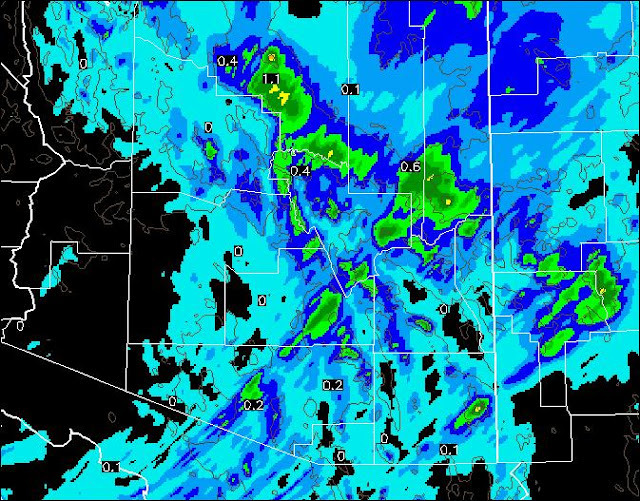 There were several early morning bands of showers across the Tucson area - about 67% of the ALERT netwrok stations measured rainfall, with amounts mostly light except in the Catalinas - see ALERT rainfall map below (amounts mostly fell after midnight). Rains were mostly over the northern portions of the ALERT network; here at the house we have 0.11" in the rain gauge this morning. It turns out that the day 2 WRF-GFS forecast verified better for last night than did yesterday morning's forecast. There has been a bit of lightning around and the 12 UTC Tucson sounding (below) shows that there is a bit of CAPE present. So a possibility of thundershowers continues this morning into mid-afternoon. Note that PW was up to around an inch and the moisture in the atmosphere this morning was very nice after such a long dry period. This morning's early WRF-GFS did not catch the showers after midnight, so the forecast of rainfall through noon tomorrow (below) may have some problems. It does appear that showers are likely today, followed by a break before frontal showers during the night. The model still forecasts strong and gusty winds this afternoon and early night - the east side of the Huachucas may be prone for a period of strong downslope winds after midnight tonight. An interesting event underway - hopefully the impacts on U of A Homecoming won't be too adverse. I forgot to factor in weekend events in my previous post. 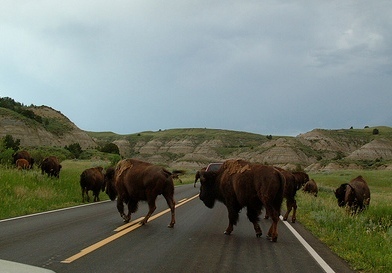 It turns out that the broken-down Colorado Buffaloes are dragging into town for the Univ. 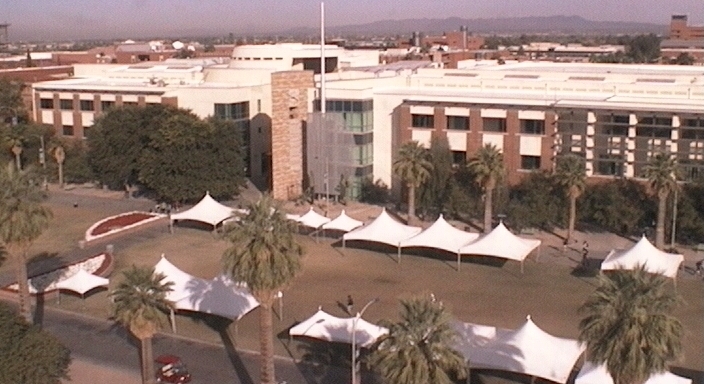 of Arizona Homecoming. I doubt that weather will be a big factor in the football game, but winds and showers could really impact the outside activities tomorrow and Saturday. The tents are already going up on the Mall - I hope the planners are factoring in the Atmo WRF forecasts! The 500 mb closed low that is forecast to dig and move across the West is currently centered off the Oregon coast - see water vapor image above from 8 am MST this morning. 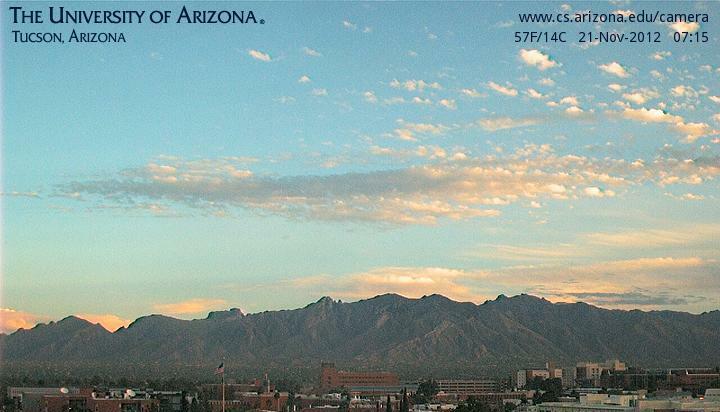 The middle and upper-level moisture and clouds that were west of Baja yesterday are now over the Southwest, with heavy, high clouds here in Tucson at sunrise. The primary impacts of this weather event will be winds and dramatic cooling, as well as the possibility of some dust and light precipitation. The early WRF-GFS forecast from Atmo indicates several periods of strong winds - the graphic above is the 10-m wind forecast for 1 pm MST tomorrow afternoon, indicating strong southwest winds ahead of the system. 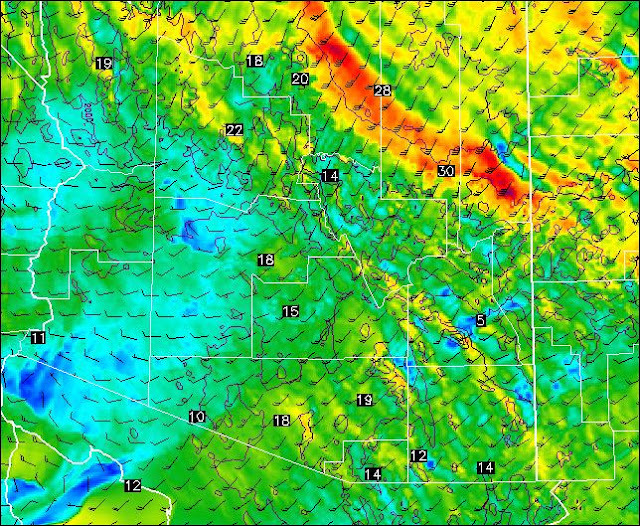 The WRF-GFS forecasts the cold front across the Tucson metro area around midnight tomorrow night, with Saturday highs only in the upper-50s (will really seem cold after several days of 90F highs). The WRF has lessened its forecast of precipitation over southeast Arizona, compared to yesterday's run. The graphic below is the total forecast of precipitation from now through midnight Saturday night. 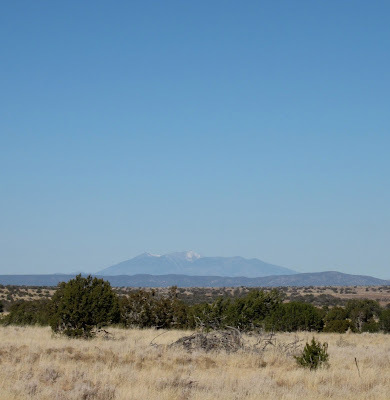 The forecast indicates that precipitation will mostly occur at the higher elevations, with the most significant precipitation occurring along the Rim and White Mountains.